A week ago, I had the opportunity to visit the famous decalogue or “ten commandments” stone outside of Los Lunas, New Mexico. I didn’t have much time to spend with it, but I was able to snap some up-close photos which can be hard to find. I’ll have to admit, I love stuff like this. I felt a little bit like Indiana Jones tracking down some kind of ancient artifact. Finding the entrance to the mountain is a little tricky. I wasn’t sure where to find the way over to the mountain because there was fencing all along the way with no roads in. 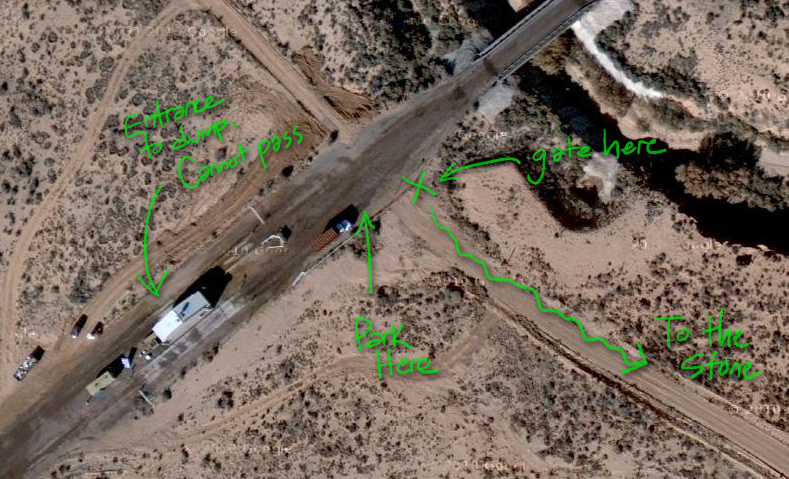 I followed the road along the fence up to this small, white checkpoint and found that it was the entrance to a dump. I told the guy that I was looking for the stone and he knew exactly what I was talking about; it was apparent that I wasn’t the first to have asked him about this. He instructed me park about 50 yards away and go through this gap in the gate. There was a road there, all I had to do was follow it, and my GPS, to the stone. It wasn’t as large as I thought it would be from other photos that I had seen, and upon immediate inspection, I got the impression that the engravings could not be as old as some people think they are. 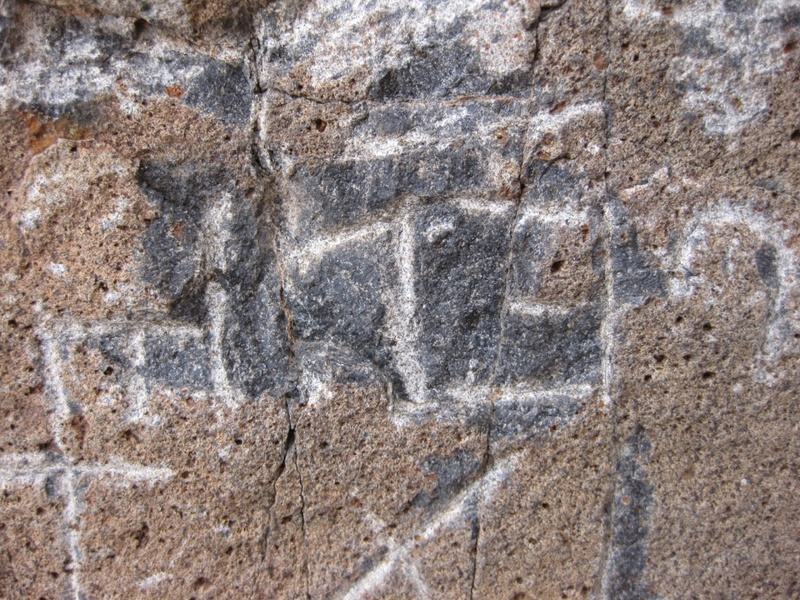 Now I am not an archaeologist or a geologist but I have seen several petroglyphs, etc in my time and I didn’t really get the impression that they were ‘ancient’. 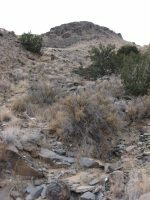 The first recorded mention of the stone is in 1933, when professor Frank Hibben, an archaeologist from the University of New Mexico, saw it. 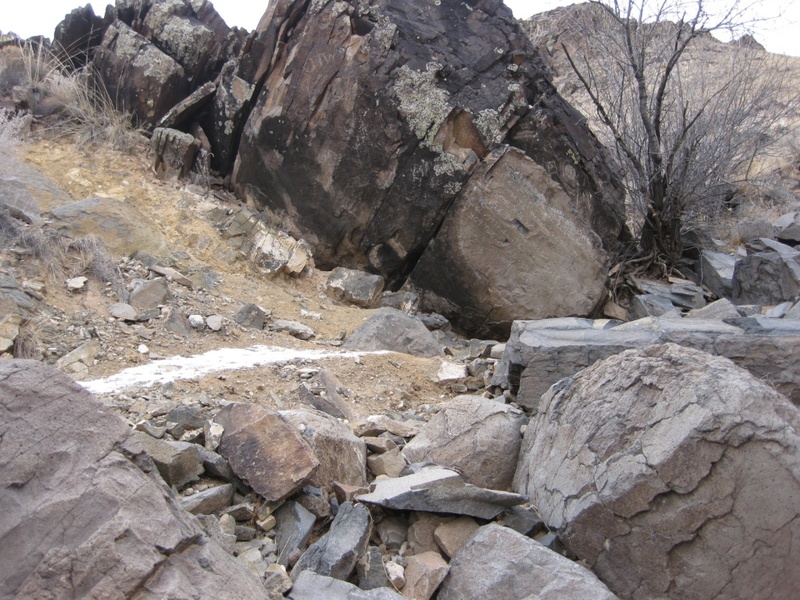 Hibben was led to the stone by an unnamed guide who claimed to have found it as a boy in the 1880s. The 1880s date of discovery is important to those who believe that the stone was inscribed by a lost tribe of Israel. The Paleo-Hebrew script is practically identical to the Phoenician script, which was known at the time, thus not precluding the possibility of fraud. 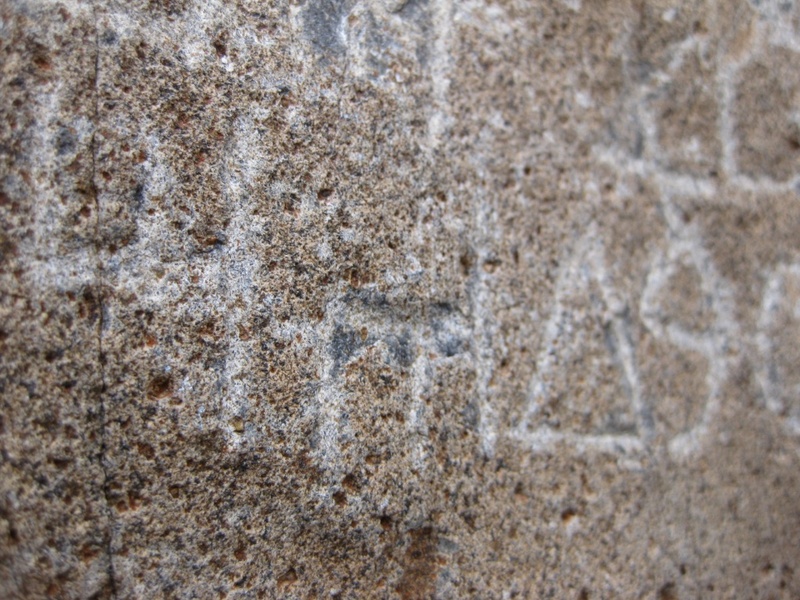 One argument against the stone’s antiquity is its apparent use of modern Hebrew punctuation, though amateur epigrapher Barry Fell argued that the punctuation is consistent with antiquity. 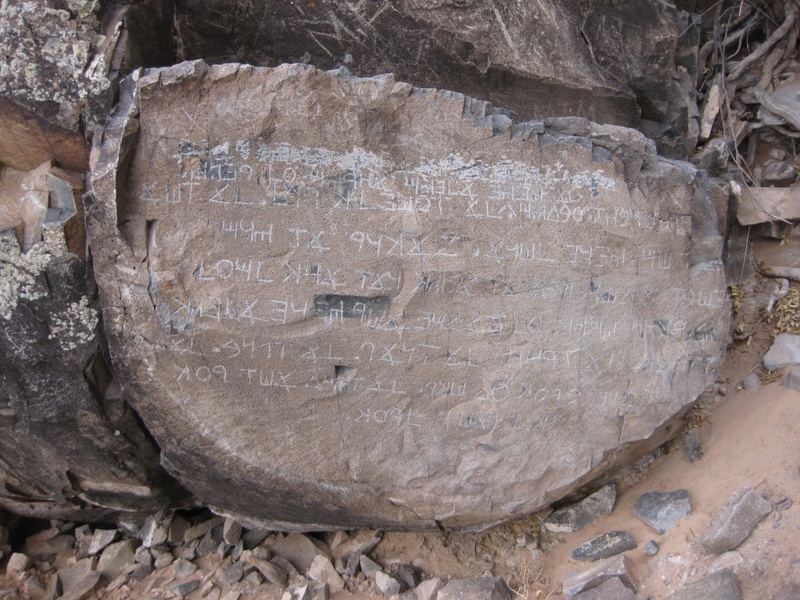 Other researchers dismiss the inscription based on the numerous stylistic and grammatical errors that appear in the inscription…Because of the stone’s weight of over 80 tons, it was never moved to a museum or laboratory for study and safekeeping. 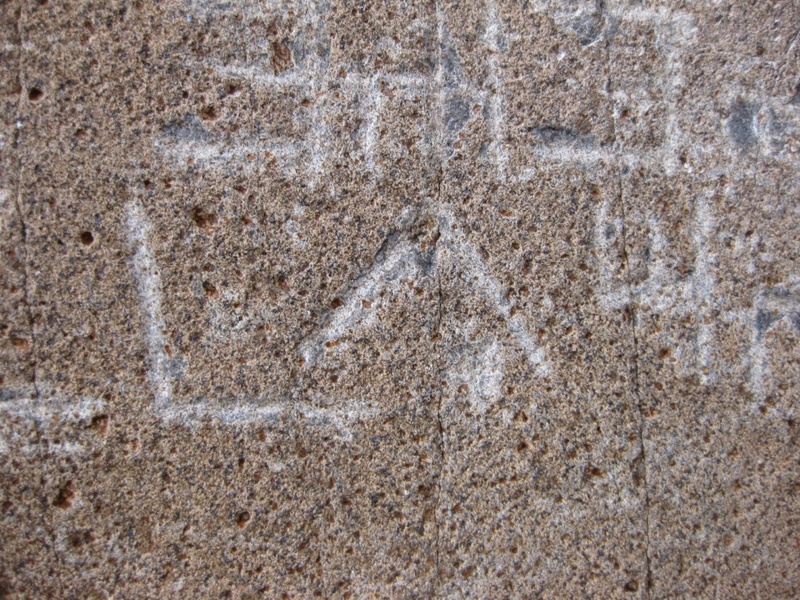 Many visitors have cleaned the stone inscriptions over the years, likely destroying any possibility for scientific analysis of the inscriptions’ patina. 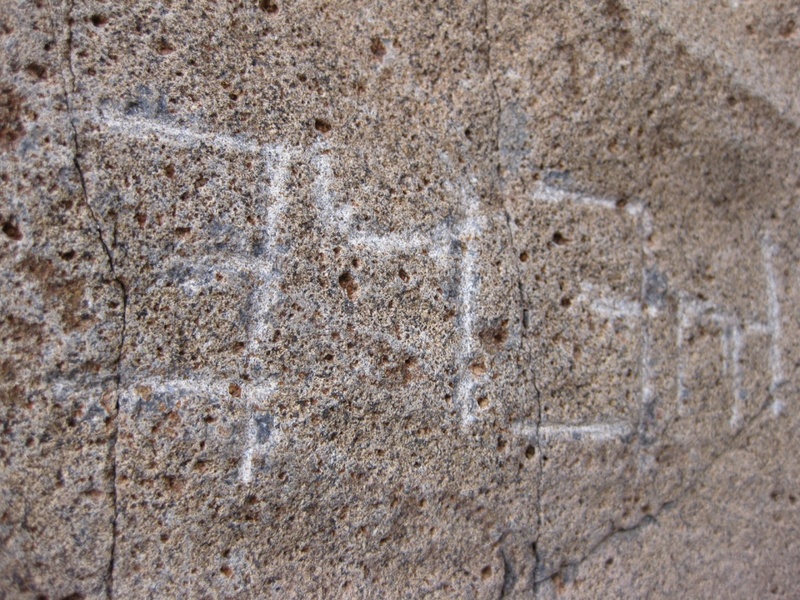 Nevertheless, comparing it to a modern inscription nearby, geologist G. E. Morehouse, a colleague of Barry Fell, estimated that the inscription could be between 500 and 2000 years old. One thing was for certain though. I noted the depth of the engravings compared to some of the graffiti that was around and I’ll have to admit, whoever carved these 10 commandments had a lot of time on their hands. It was certainly a task that must have taken several hours to do, if not days in my estimation. I’ve posted some photos below with some comments. 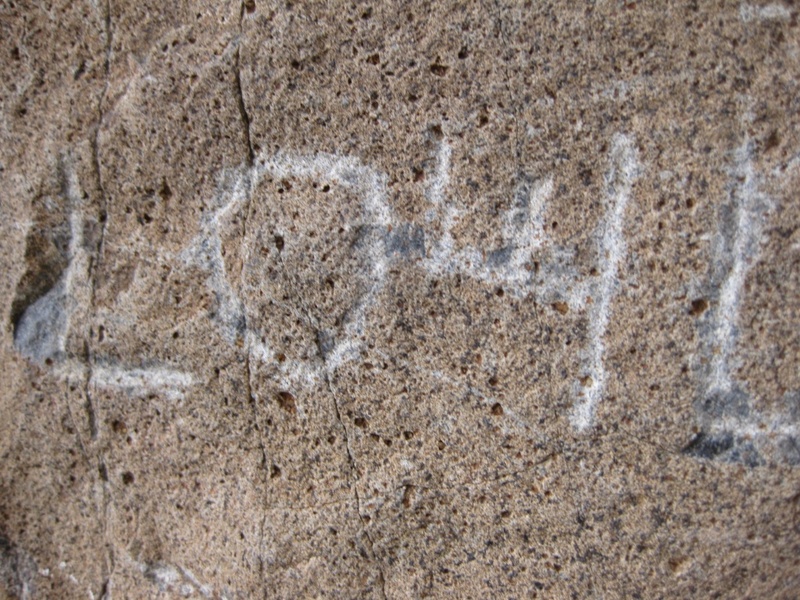 This is some modern graffiti. Note the depth and sloppiness of it, very shallow and messy while the other carvings are deeper and more deliberate. I first heard of the stone over a decade ago from an acquaintance. He had toured the stone with a Jewish guide who believed the stone was authentic. This acquaintance of mine had another interesting theory about the stone’s origins. 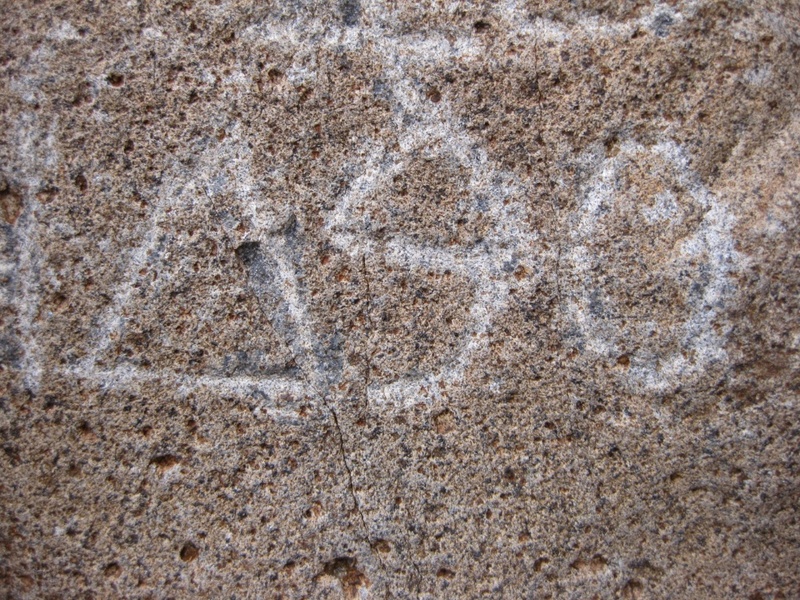 He theorized that the stone was carved by someone in the Mormon Battalion as they may have passed through that area. Some of the members of the Mormon Battalion participated in the school of the prophets where ancient Semitic languages were studied. 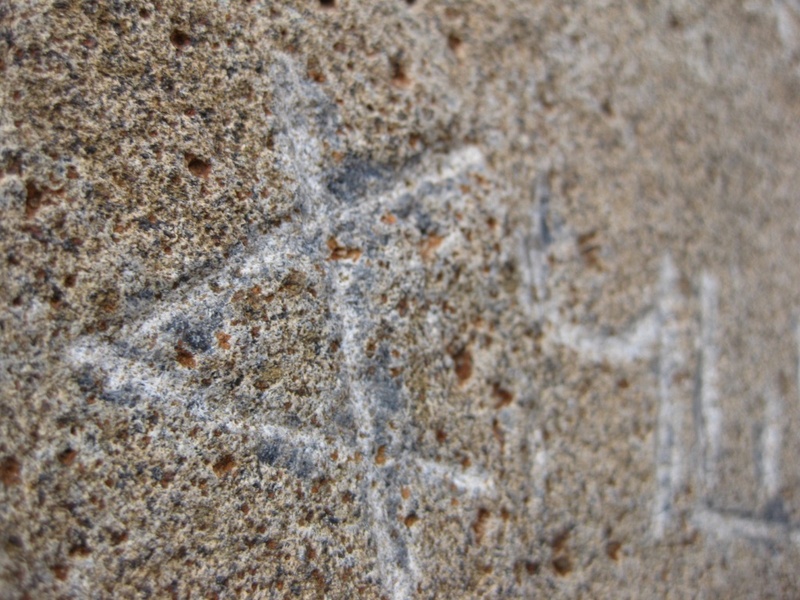 The stone could have been just the etchings of a bored solider, which would explain some of the typos and errors in the text. 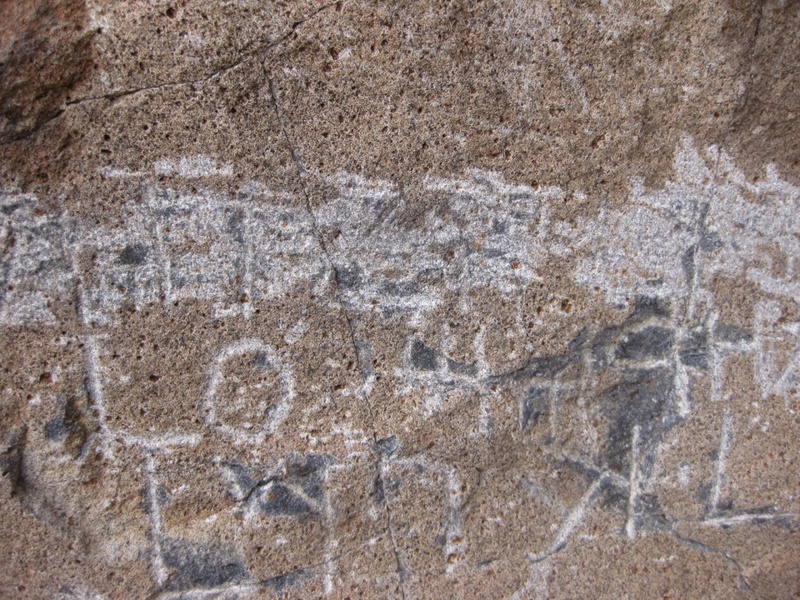 There are other petroglyphs on this mountain however that point to ancient origins of the decalogue stone. There is another stone higher up the mountain that has constellations carved on it. These carvings show many of the signs of the zodiac with one particular image of a partial solar eclipse and the constellation scorpio. Astronomers have found that this particular solar event would have taken place in 107 B.C. 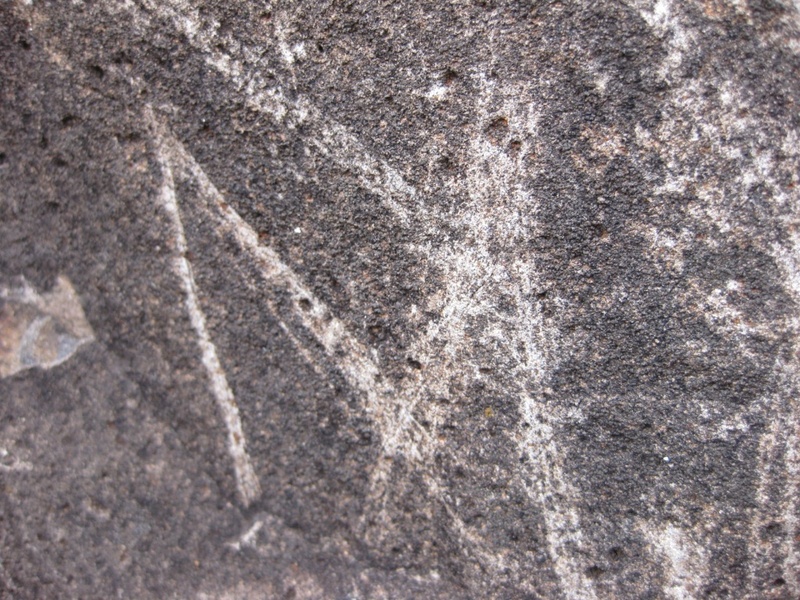 which coincides with the dating of the engravings to around 2,000 years ago. Authentic or not, it was a pretty fun place to visit and it’s too bad that vandals have taken to the destruction of some of the engravings. Honestly, I can’t really make up my mind on this thing, if it is authentic or not, I am about 80% sure that the engravings were probably done within the last 150 years or so at least. The Mormon Battalion theory makes the most sense to me, but there really isn’t any evidence to back that one up. Who knows, they’re always discovering new facts about some of these things as new evidence is dug up out of the ground elsewhere in the world. We’ll just have to wait and see. New film release, “Hidden Mt. & the Los Lunas Mystery Stone” now available! Oh wow, I don’t think I’ve ever seen anyone produce a film about the Mystery Stone. I’m going to check it out, thanks! Ok Aaron, I finished watching your film and you had some good stuff in there. I’m glad that you included the information on the zodiac at the summit of the mountain because that is probably the most compelling aspect of the whole place since it points to a historical event that can be corroborated. If we assume that because of the remote location of the stone that the inscriber was a traveller of some kind, some interesting ideas arise. 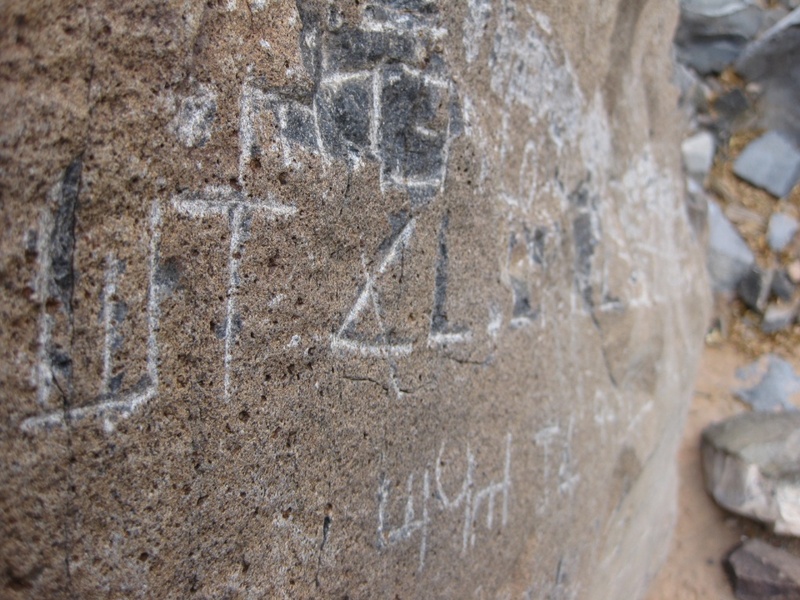 What if the carving was done by an illiterate individual who possessed an inscription of some kind containing the same abbreviated decalogue that he carried with him for religious reasons. 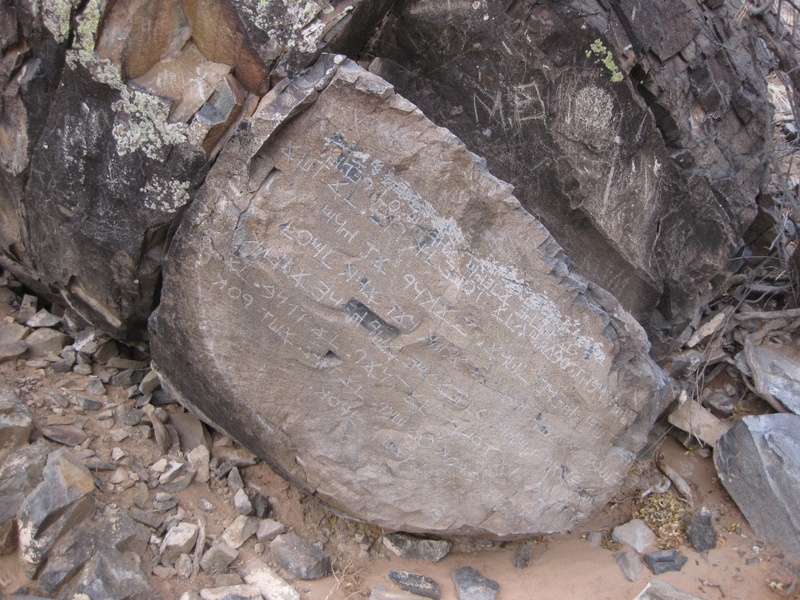 It doesn’t make much sense to produce a compact version on the 10 commandments on a large stone with a lot of space, but maybe the original inscription was abbreviated because it was on a smaller object that would have been practical for travel. 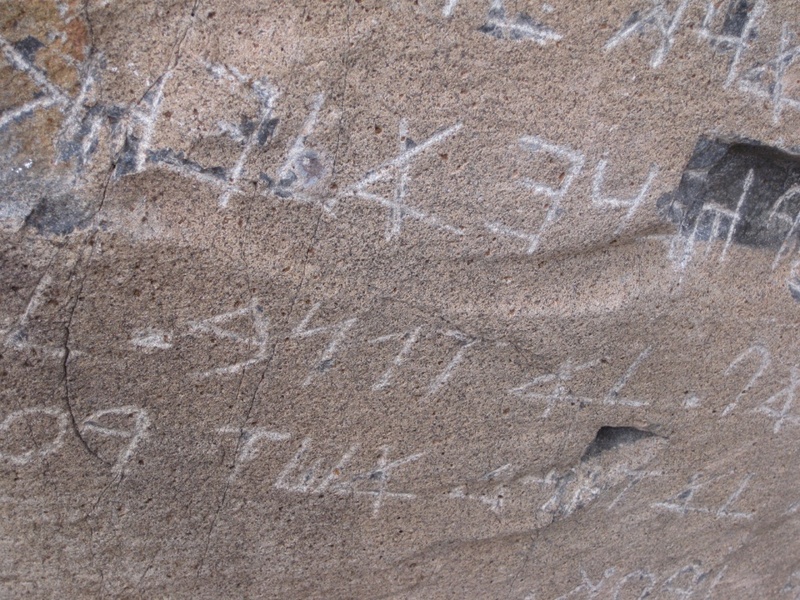 Then, this illiterate individual had the idea to adorn this stone with these sacred commandments and did his best to copy them from the abbreviated version he possessed onto a larger space. In doing so, he made several errors but as he progressed he took his time and was more careful and did a better job of copying it all down correctly. Being illiterate, he would not have known how to correct his mistakes. It’s just more speculation but it is fun and interesting to think about all the possibilities isn’t it? I have visited the stone many times. Once I even met up with David Deal there who wrote the best book on it that I know of. I don’t, however, agree with his, and others, conclusion that it’s pre-Columbian. I say this because about two feed to the left (as you face the stone) is another stone with a couple of chiseled lines carved with an obviously beveled masonry chisel. 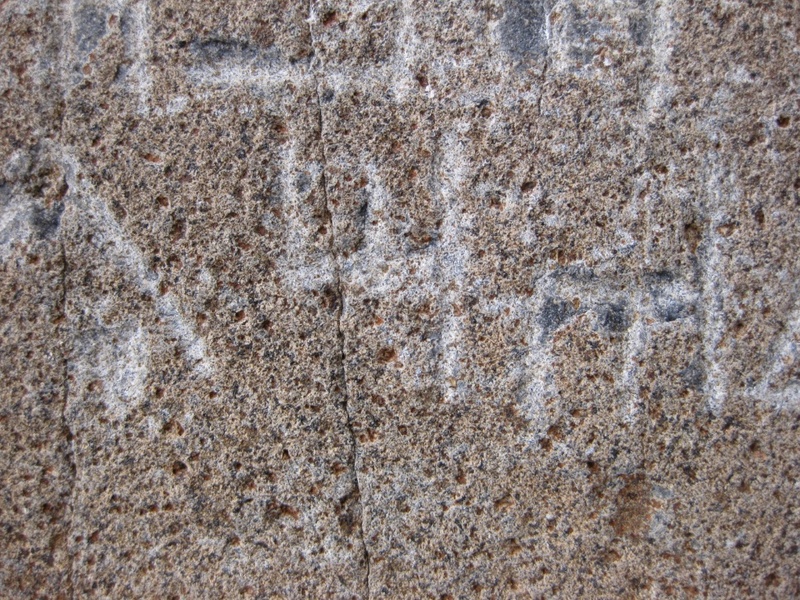 Upon close inspection of the Decalogue stone, one can see the beveled nature of the carving on many of the glyphs. So if a steel chisel was used, it is IMO, not ancient. You know, I think I agree with you. I don’t think it is that old. It was probably done in the 1800s, but the real question is by who and why? If it was a hoax why wasn’t there more of a buzz and some guy going around claiming that he found an ancient relic. 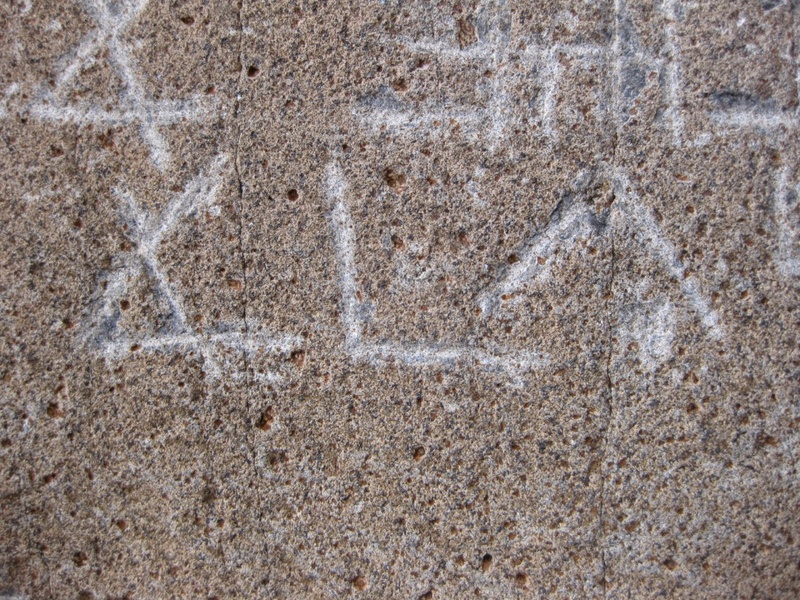 How many people knew how to write in that old form of Hebrew at the time? 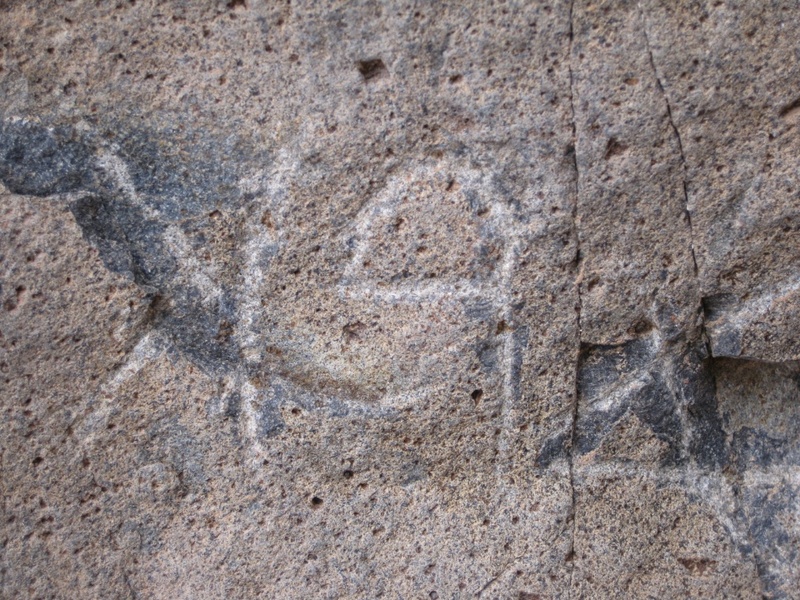 After seeing it myself it didn’t look as ancient as some of the Indian petroglyphs I’ve seen. Typically, those rocks have a patina on them. 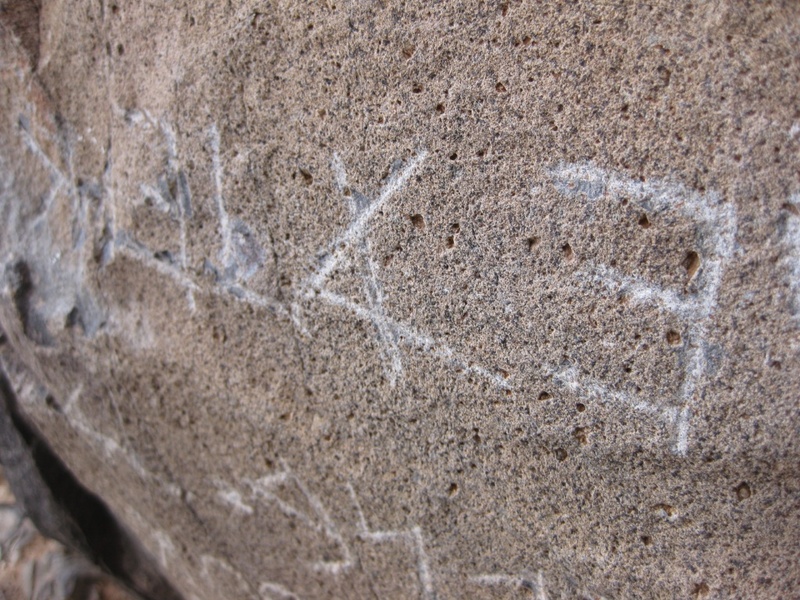 However, if the story about Boy Scouts cleaning the rock and maybe wiping a lot of the patina off to make the letters more visible is true, that could explain why it doesn’t look that old. So I dunno, I still think there’s something about the area that holds some interesting secrets, but I don’t know what they are! True. Don’t rule out copper or even just rubbing the letters in with other rocks. 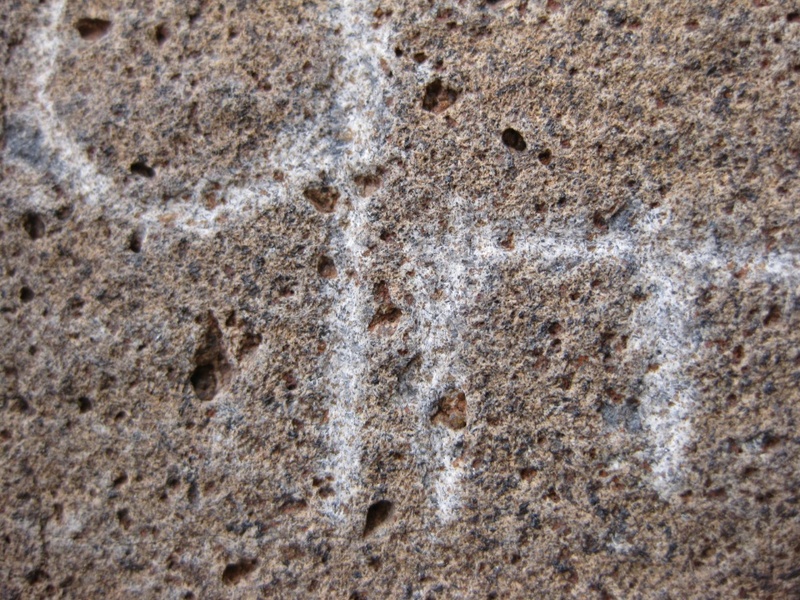 The decalogue stone letters looked rubbed in rather than chiseled in. I took a rock and rubbed it on a boulder nearby and although it would take some time, I don’t see why you couldn’t replicate those letters that way. My research is to better define routes used by the Mormon Battalion (MoBat) during their enlistment year of July 1846-47. My background is geology/geography with considerable experience in photo interpretation. My wife and I hiked the entire Battalion main route in 2008-09 conducting field research. Occasionally I see these articles/posts that postulate a connection between the MoBat and the Decalogue Stone. I’m not sure, but I think if was ‘discoverer’ Frank Hibben himself who first implied that perhaps the MoBat may have created it since they were “active in the area”. Truthfully, they were marching pretty fast through the area and only camped one night in the vicinity – October 26, 1846. 1) The Navajos in the area were very aggressive at the time. Going out alone was sure to get you killed and even being in a family settlement was not enough protection. On 25 October, thousands of sheep were driven off from the Lunas family casa and two shepherds killed. The Otero family at los Chavez also lost two men and more sheep about the same time. See Cooke’s journal. 2) Military Discipline: As the MoBat started off in the morning of the 26th, Ltc P St George Cooke – their new commander of just two weeks – had demoted Sergeant Elmer down to private for not getting his platoon ready for morning roll call. (Daniel Tyler, Concise History of the Mormon Battalion, Chapter 13; 26 October). Cooke – a 20 year Army veteran commander of calvary and assigned by Gen Kearny to lead the Mormon group – was not tolerating his new command in ‘doing their own thing.’ He was working to bring strict military discipline to the group. Reporting for the morning and evening duty/sick calls was one of his earliest demands upon the Mormons. The men HAD to be in line and report for duty. Morning roll call on the 27th likely was about 6 AM as sunrise was 6:20 AM (typical behaviour for Cooke was to have them in line before sunrise). From Los Chavez out to “Mystery Mountain” is (by direct line) 14.37 miles. This gives a round trip distance of nearly 30 miles. Their average rate of travel afoot was about 2 mph. Assuming the perpetrators (you’d need more than one person involved, yes?) used mules, the average rate of travel can be bumped to perhaps 4 mph – but this is going on in the night time which would slow them back down to perhaps 3 mph. My research shows General Kearny, an experienced dragoon leader, during his return to Ft Leavenworth from California rarely exceeded 4 mph while riding. Add to that time necessary to etch the inscription, requiring a few hours at least. Minimum time: 7.5 hours round trip travel (by fast mule) plus 3 hours to etch the stone = 10.5 hours. Weather: It rained a lot on the 26th and 27th with snow on the mountains. Robert Whitworth recorded there was substantial wind as well. This was a winter-time cold front. The etching would have had to have been done in the dark or using candles – and the Army didn’t provide many of them. A campfire is possible, however, a fire would likely attract attention of the Navajos. The wet conditions would also have been a factor. Motive: The men were always willing to connect ‘ancient’ things they were encountering as evidence to support the Book of Mormon, however, in all my research, I find the contemporary journal entries to be honestly relating what happened. They accurately relate what they see. They are not liars. They may interpret incorrectly, but they are not liars. None of the men (to our knowledge) ever makes a claim to have seen the Decalogue Stone. No one of the Battalion directs anyone to it. None of the descendants ever makes a statement about it. Nope – I think we can lay to rest the theory that someone from the Mormon Battalion was involved in any way with its creation. We do a disservice to even repeat that claim except to refute it. Great stuff, Kevin. I think you have put that theory to bed. It would have taken many hours to create that inscription and your research suggests that this would not have been likely given numerous factors. The MoBat theory was one explanation postulated by a guy I knew who was very smart but I don’t think he was as well informed about the Battalion as you seem to be. He never presented any evidence other than they were passing through the area and some may have studied Hebrew in the school of the prophets. Thanks for your contribution to this article, I appreciate your time and information. As a follow-up to my prior post and in expectation that someone may want to actually do some quantifiable science: A mobile, field-capable Raman spectroscopy could be employed to look for evidence of any metal embedded in the etching. My suspicion is that many subsequent visitors have used knives and other tools to ‘refresh’ the original etching, but it might be possible to detect really old metal fragments which could be evaluated for the isotopic content. This might be able to rule in/out very old metal being used to etch the inscription. A specialist in Raman spectroscopy should be consulted for advice on making any such effort. That’s a really cool idea, I don’t know you would talk to to get that set up. The rock is just out in the middle of the desert and nobody seems in charge of it.